Dresden has a large tramway network operated by Dresdner Verkehrsbetriebe, the municipal transport company. Because the geological bedrock does not allow the building of underground railways, the tramway is an important form of public transport. The Transport Authority operates twelve lines on a 200 km network. The bombing of Dresden by the Royal Air Force and the United States Army Air Forces between 13 and 15 February 1945 remains a controversial Allied action of the Western European theatre of war; the inner city of Dresden was largely destroyed by 722 RAF and 527 USAAF bombers that dropped 2431 tons of high explosive bombs, and 1475.9 tons of incendiaries. 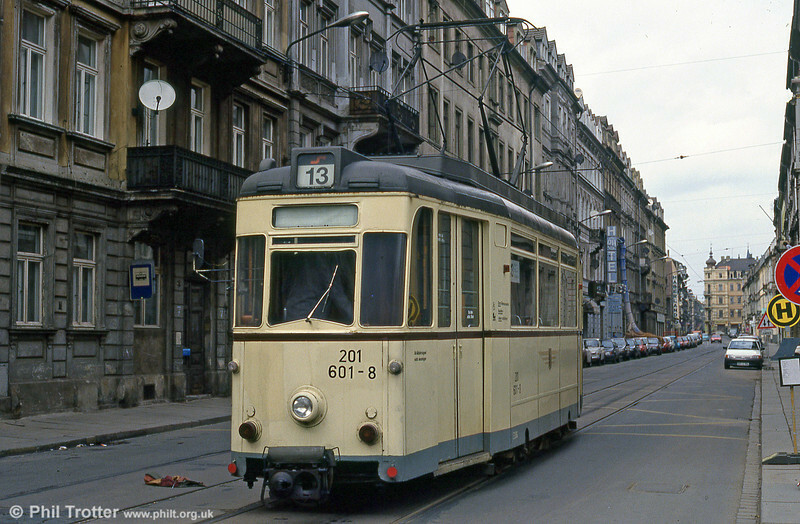 Dresden still had this Gotha car working on one route on 18th April 1993. Built in 1960, the car was foat Chemnitz. Seen here in Rothenburger Straße.